The monarch butterfly is probably one of the most recognizable of all the North American butterflies. In recent weeks you may have noticed a lot of them in the area and haven't given them a second thought. But did you see any earlier this summer? I can count on one hand the number of monarchs I saw this summer until a week or two ago. These once common butterflies are becoming increasingly rare. Monarchs have fascinated researchers for many years, and continue to mystify them with their migration process each year. They are the only butterfly known to make a two-way migration much like birds do. In the mid-1990's, scientists estimated that there were approximately 1 billion monarchs in North America. Less than 20 years later in 2013, populations dropped to an all-time low of 33 million—a loss of about 97% of the population. Three private conservation groups plus a monarch researcher petitioned the US Fish and Wildlife Service to consider the monarch butterfly for protection under the Endangered Species Act. In December 2014, the US Fish and Wildlife Service officially announced the monarch is being considered for inclusion on the endangered species list. They will assess the population data and issue their official conclusion in spring 2016. Some people may think this is a lot of fuss being made over an insect. Regardless of your opinion on the value of insects, it is noteworthy that this species has declined so severely in less than 20 years. One source I read said that this steep of a decline if it were US citizens would be like losing every American except for those living in Florida and Ohio. A typical generation of adult monarch butterflies is ready to reproduce four to five days after emerging, and lives for two to five weeks. The fourth generation in a given year is different though. It emerges, but is not capable of reproducing. It is thought that changes in the chemistry of their milkweed host, day length and temperature produce this "immature adult" butterfly. This generation joins other "immature adult" monarchs in late summer and early autumn and begins its journey thousands of miles south to overwintering locations in California and Mexico. Those west of the Rocky Mountains congregate in California; those to the east of the Rocky Mountains journey to Mexico. 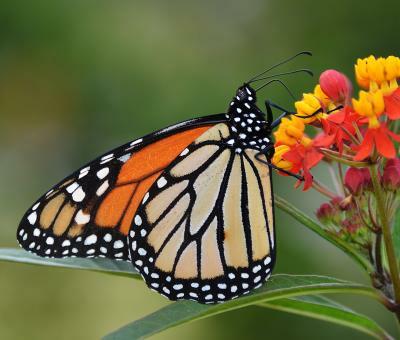 Scientists have documented that the monarchs use the same sites year after year. It is thought that the monarchs use a combination of the sun's orientation and detection of the earth's magnetic pull to find their way during migration. The monarchs spend the winter clustered together to conserve energy, and the overwintering sites themselves are perfect microclimates to support their survival over the winter months, providing appropriately warm temperatures and a water source. Monarchs do not eat over the winter months. Lengthening spring days are thought to be the trigger that starts the overwintering monarchs to fully mature and begin mating. They also begin their journey north in search of milkweed plants to lay their eggs on before dying. This overwintering generation of monarch butterfly will typically live for 8 to 9 months, many times the typical two to five week lifespan of other generations of monarchs. Adding to the migration mystery, scientists still do not fully understand how the great-great-grandchildren of this overwintering generation know how to make the southern migration later in the year. Other animals that migrate in two directions, like birds and whales, learn the migration routes from older generations. This is not the case for monarchs. They just mysteriously know. Scientists used to think that the most of the overwintering generation only made it as far north as the Texas, Oklahoma and the Gulf States each spring. But recent research has shown that more of this overwintering generation make it to the Midwest in the spring than was previously thought. The Midwest is the source of a population explosion each spring that disperses monarchs across much of North America. With this in mind, sources of food for the monarch—milkweed—take on increased importance. Scientists have linked the decline in monarchs to several factors, but the most important one appears to be the drastic decline their only food source, native milkweeds, in particular common milkweed, Asclepias syriaca. Many sources link this decline in milkweed to increased use of herbicides like glyphosate by agriculture, increased land development, and increased roadside mowing. Several groups interested in preserving and improving the monarch population encourage homeowners to plant native milkweeds as part of their landscapes. Milkweeds are a low maintenance option for the landscape and can be quite attractive as part of a perennial garden or natural area. Monarchs have an interesting link to central Illinois. Some readers may know that the monarch butterfly is the state insect of Illinois. But many may not know that the petition to make the monarch the state insect originated in 1974 with a class of third graders at Dennis School in Decatur. Representative Webber Borchers introduced a bill to the Illinois General Assembly to make the monarch the state insect, the schoolchildren lobbied for the bill's passage, and were present when Governor Daniel Walker signed the bill into law in 1975. To this day, the school still celebrates the monarch's "birthday" as the state insect each October 1st.